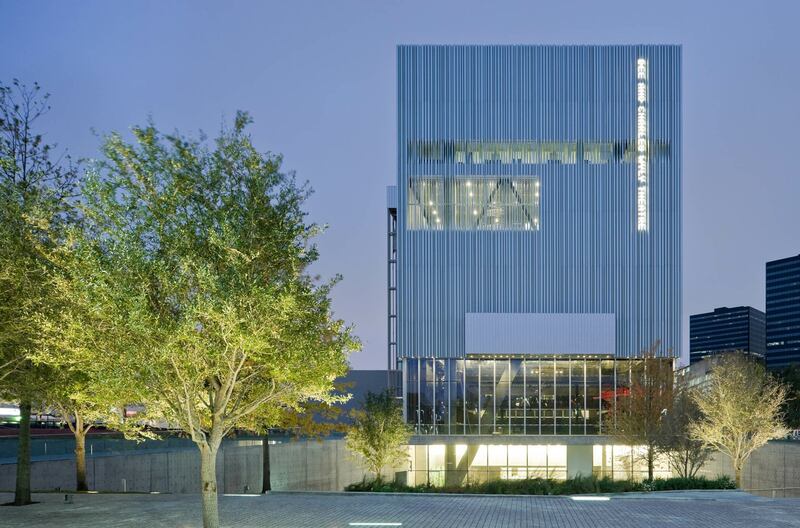 Situated on the south side of the Dallas Center for the Performing Arts’ Grand Plaza, the Dee and Charles Wyly Theater accommodates unlike a typical theatre, back-of-house and front-of-house areas above and beneath the auditorium rather than wrapped around it, liberating its ground floor perimeter – a glass facade with optional blackout blinds – for direct contact with the urban surroundings. The theatre which can seat up to 575 people in multiple configurations using flexible floor and seating elements can create an infinite variety of theatre arrangements, from the completely open to the completely enclosed. A highly comfortable fresh air supply is used for the auditorium by a displacement ventilation system via low velocity floor / seating supply serving as supply air plenums for the auditorium. An optimized low velocity overhead air supply fed from a decentralized air handling unit is providing good thermal comfort with minimal installations for stage. Using thermal stratification within the spaces minimizes cooling energy and necessary air flows as temperature differences between supply and exhaust are increased. Controlled ventilation openings at top of the fly tower take advantage of natural ventilation in case of moderate ambient conditions. An integrated heat recovery system between top level air exhaust and the air supply reduces heat and enthalpy losses in winter and summer mode. Office spaces are equipped with radiant chilled ceilings that enhance thermal comfort by its radiative cooling effect that allows to reduce air flows within these spaces.